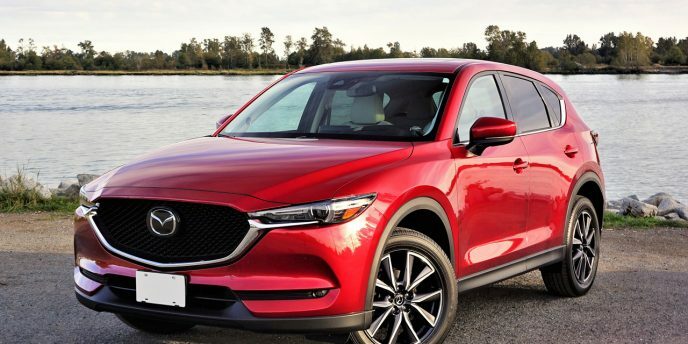 Mazda is in a unique branding position, in that it’s wholly independent and therefore able to offer more for the money than some of its rivals. What do I mean? Most of Mazda’s rivals offer a higher priced premium brand for owners to gravitate to when they might otherwise feel the inclination to move up to a BMW or Mercedes-Benz, and therefore they won’t allow their mainstream volume models to wander too far upmarket in design or finishings so as not to interfere with this hierarchal brand strategy, but Mazda has no such constraints, so therefore its cars and SUVs are often a cut above their rivals. 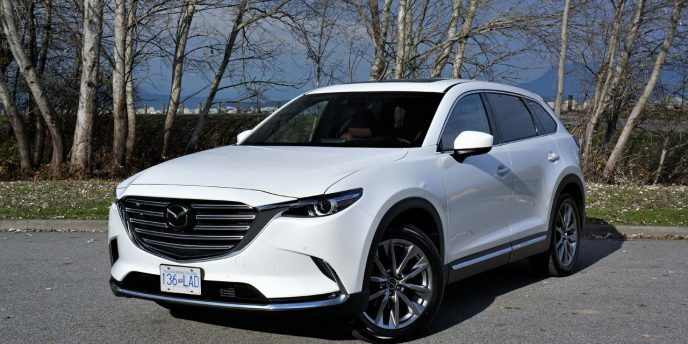 Take the 2019 CX-9 mid-size crossover SUV I’m driving this week. It looks like it could’ve rolled off the assembly line of a luxury manufacturer thanks to a big, stylish satin-silver grille with special night illumination that wraps around its lower half, full LED headlamps with auto high beams, adaptive cornering capability and auto self-leveling, a beautifully aerodynamic lower front fascia with integrated LED fog lamps, stunning 20-inch light grey high lustre alloy wheels wrapped in 255/50R20 all-season tires, tastefully applied satin-chrome trim all-round, and a great deal more on the outside. That said it’s the CX-9 Signature’s interior that really makes occupants feel pampered, much thanks to a two-tone brown and black motif that includes soft Nappa leather upholstery with beautifully detailed stitching, genuine Santos Rosewood trim on the centre console and doors, aluminum dash and upper door panel inlays, satin-chrome interior switchgear, loads of soft-touch surfacing throughout, fabric-wrapped front roof pillars, LED overhead and ambient lighting, plus more, while areas not seen are stuffed full of sound-deadening insulation, the windshield and front windows are made from noise-isolating glass, and plenty of additional refinements to the body shell, steering and suspension systems make everything from the way its doors close to the CX-9’s overall driving dynamics feel as if it were a luxury-branded SUV, while providing a much quieter interior. The driver and passengers alike will be comforted in other ways too, for instance in the knowledge that the CX-9 Signature is one of the most advanced vehicles on the road when it comes to advanced driver assistance and safety systems, with all the usual active and passive safety features complemented by adaptive cruise control with stop and go, forward obstruction warning, Smart Brake Support and Smart City Brake Support autonomous emergency braking with pedestrian detection, advanced blind spot monitoring, rear cross traffic alert, lane departure warning, lane keeping assist, traffic sign recognition, new seatbelt reminders on the second- and third-row seats, and more. The CX-9 Signature offers an impressive assortment of electronics too, such as a head-up display that projects key information onto the windshield ahead of the driver for easy viewing, a 7.0-inch colour TFT display within the primary gauge cluster, an 8.0-inch tablet-style infotainment touchscreen on the dash top with new Apple CarPlay and Android Auto smartphone integration, new SiriusXM Traffic Plus and Travel Link data services with information on real-time traffic, weather conditions, fuel prices, and sports scores, a new four-camera 360-degree surround parking camera with a bird’s-eye overhead view, navigation with detailed mapping, 12-speaker Bose audio with Centerpoint surround and AudioPilot noise compensation technologies, plus SurroundStage signal processing, satellite and HD radio, voice activation, Bluetooth phone connectivity and audio streaming, text message reading and response capability, plus much more for just $51,500, which is superb value when comparing to luxury branded crossover SUVs with similar equipment (check out all 2019 Mazda CX-9 trims and pricing at CarCostCanada, plus make sure to learn about any available rebates and save even more by getting the 2019 CX-9’s dealer invoice pricing). Other features that provide CX-9 Signature owners with a premium-branded experience are proximity access with pushbutton ignition, an electromechanical parking brake, a new frameless auto-dimming rearview mirror, new power-folding side mirrors, a Homelink garage door opener, a reworked overhead console with always appreciated sunglasses storage and a better designed LED room lamp control switch, front and rear parking sensors, tri-zone automatic climate control, a heated leather-wrapped steering wheel with premium cross-stitching detailing, a 10-way power-adjustable driver’s seat with powered lumbar support and memory, an eight-way powered front passenger’s seat with power lumbar, three-way heated and new cooled front seats, heated rear outboard seats, rear side window sunshades, and more. The changes to the CX-9’s steering and suspension systems not only provide the higher-quality, more premium-like ride noted earlier, but were also designed to deliver greater linear behavior at high speeds, and I’ll let you know how Mazda succeeded in my full road test review. Likewise, I’ll comment on how the carryover its G-Vectoring Control technology feels while seamlessly shifting more torque to the front wheels during corner entry and then sending it rearward upon exit, how i-Activ AWD deals with inclement conditions (although we only had to deal with a rain storm during our weeklong test), how the dynamic pressure turbo-enhanced SkyActiv-G 2.5 four-cylinder engine responded to throttle input at takeoff, when exiting fast-paced corners and while passing on the highway, and whether or not the SkyActiv-Drive six-speed automatic transmission was still up to snuff in an era of seven-, eight-, nine- and even 10-speed autoboxes, not to mention CVTs, despite the inclusion of manual actuation and Drive Selection with a Sport mode. Mazda is very clear in its specifications that the engine makes 250 horsepower with 93 octane gas or higher, but I’m going to correctly guess that the majority of journalists refill it will much cheaper 87 octane, so the engine is probably only making the 227 horsepower claimed with the lower grade gasoline, but this said its extremely robust 310 lb-ft of torque doesn’t change with the budget fuel and only needs 2,000 rpm to release full twist, so I wouldn’t worry too much about thrust. Power isn’t my thing. Most who have it don’t know how to wield it, and being libertarian in mindset I truly only want enough power to rule over my personal space. The MX-5, with its modest 155 horsepower and 148 lb-ft of torque, has always fit very well into such ideals. Over the years I’ve heard some complain that its response off the line is somewhat tepid when compared to other sports cars in the category, and when considering these are the same folks unsatisfied with the Subaru BRZ/Toyota 86’s much more potent 200 horsepower engine their frustration probably has some merit. I’d rather have high revs and sensational sounds combined with a light curb weight when piloting a four-cylinder powered sports car, yet even with such reasonable expectations the outgoing mill left me feeling a bit flat. Enter the 2019 MX-5, with a revised 2.0-litre four-cylinder capable of spinning 700 rpm higher before redline, from 6,800 to 7,500 rpm, while power is up 17 percent to 181 horsepower, and torque has increased by 3 lb-ft to 151. How did they do it? A few trick engineering tweaks included lighter weight pistons and a redesigned flywheel, plus Mazda also modified the rear differential ratio for quicker response off the line and faster acceleration overall. And what about the dull soundtrack? A new sport exhaust system certainly ups the excitement ante, but rather than spill the entire bowl of beans now in this Garage preview I’ll go into greater detail about all of the above in my upcoming road test review. Until then, here’s some background info: a six-speed manual comes standard, while a six-speed automatic featuring manual-shift mode, paddle shifters, and Drive Selection modes is optional. This tester gets fitted with the former, exactly the way I’d choose it if mine, and exactly the way I’ll enjoy it best throughout my test week. You might also notice a retractable hardtop, this particular MX-5 being the RF version introduced last year, which gets a sharp looking coupe-like all-weather roof that conveniently powers away when you’d rather feel a wisp of mother nature’s breath in your hair. It’s only slightly easier to live with than the regular soft top, but for those who live, work or just travel through crime-ridden neighbourhoods, it brings an element of security to a car that’s never had such locked down advantages before. With a focus that’s never deviated from performance despite the MX-5 gaining refinements with each generation, even this top-line RF GT weighs in at just 1,118 kilograms with the manual and 1,134 kilos with the auto, which is just 53 kg more than the base soft top. I know, to those autocrossing or racing on the weekend, and there are many MX-5 owners that do, an extra 50-plus kilos of mass exactly where they don’t want it, up high over the head, but for the rest of us who simply want to enjoy the fastest way around the highway entrance ramp, it’s also a great way to cloak away the noise of the outside world. Along with the engine upgrades, Mazda improved the driving environment with a new telescoping steering column, important for setting up your driving position for optimal comfort and control. Continuing on the ergonomic theme, Mazda gave its driver’s seat new easier to use adjustment levers, while the door panels and cupholders are redesigned for 2019. Black metallic painted alloy wheels in 16- and 17-inch diameters are new this year as well, while the 195/50R16 and 205/45R17 tires wrapped around them, the latter standard with the RF, stop better when the MX-5 to new standard Smart City Brake Support (SCBS), while Traffic Sign Recognition (TSR) is also new this year, but requires an upgrade to GT trim. Additional advanced driver assistive systems that are standard across the line include Advanced Blind Spot Monitoring (ABSM), Rear Cross Traffic Alert (RCTA), and Lane Departure Warning System (LDWS), while the 2019 MX-5 continues to come with all the expected active and passive safety features too. The MX-5 soft top is available in three trims, including the $32,900 GS, $36,900 GS-P, and $39,900 GT, while the RF can only be had in the two upper trims starting at $39,900 and ending at an as-tested $42,900, plus freight and fees of course. 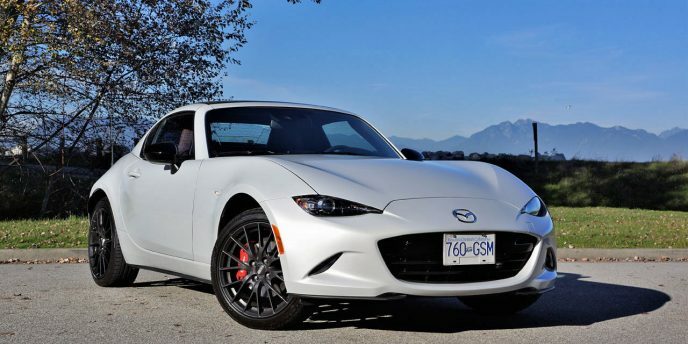 See all 2019 Mazda MX-5 prices at CarCostCanada, plus make sure to check the dealer invoice price of the car you choose before buying, as it could save you thousands. OK, not exactly as tested. My tester also had $200 worth of Snowflake White Pearl paint coating the exterior panels, and instead of standard Black leather with Red Koko stitching, or no-cost Sport Tan leather with Tan Kodo stitching, Mazda had added the $900 Exclusive Package that included a gorgeous caramel coloured Chroma Brown Nappa leather inside plus a contrasting piano black roof top to the exterior. Yes, I think I’d need to spring for this too. Interestingly, the aforementioned automatic transmission is a no-cost option despite its many enhancements, with the only other option being a $909 set of 17-inch matte black alloys wheels. 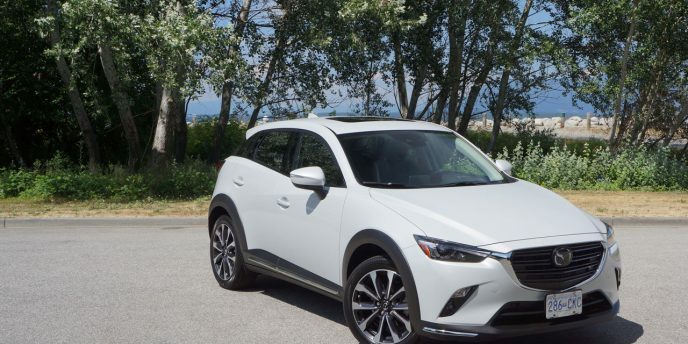 Canada’s subcompact SUV segment has been growing like gangbusters in recent years, and the highly successful Mazda CX-3 is one of the key reasons it’s doing so well. The CX-3, in fact, is one of the class bestsellers, sitting third out of 16 entrants at the end of 2017 (there are now 17 competitors). That’s a truly impressive feat, while it’s also one of just three challengers to bypass five figures in annual sales. 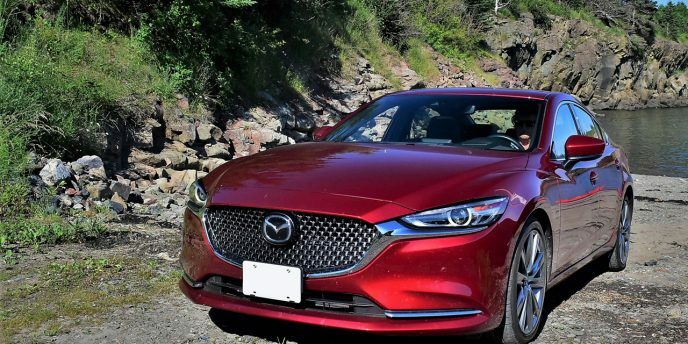 Having been on the market since May of 2015 and therefore mostly unchanged, Mazda felt it was time for a mid-cycle update and therefore we’ve got the new and improved 2019 model in our garage this week. Changes to the exterior include a revised grille, new taillights and updated wheels, while the cabin gets some nicer materials, a new set of seats, plus a redesigned centre console that incorporates a de rigueur electromechanical parking brake switch replacing the previous model’s old-school mechanical brake lever, and by doing so frees up significant space between the front seats while helping to modernize the driving experience. Additional 2019 updates include advanced blindspot monitoring, rear cross-traffic alert and Smart City Brake Support (SCBS), the latter utilizing a near infrared laser to detect vehicle activity up to six metres ahead before applying the brakes automatically to avoid a potential accident, all of which even gets added to $20,795 entry-level GX trim (see CarCostCanada.com for all the trim, pricing and options details, plus rebate info and dealer invoice pricing), while the as-tested top-line GT model now comes standard with genuine leather upholstery in place of the outgoing model’s leatherette. What’s more, 2019 GT models also come standard with all of the features in last year’s optional Technology package, which means that features like satellite radio, automatic high beam assist, and lane departure warning no longer need the addition of an upgrade. The new Mazda CX-5 was the last 2017 model I tested and will be the final 2017 review I'll write. I wasn't actually sure if I was going to cover it at all, being that one of my freelance journalists did the honours earlier and his review is still available for your perusal, but nevertheless the new CX-5 impressed me so much I couldn't leave it alone. I know I'm not alone in my accolades, with most every auto industry pundit praising its virtues. Before I delve into all that's great about the 2017, as well as its two minor disappointments, take note that the outgoing first-generation CX-5 was already a very impressive compact SUV, so therefore moving up to this second-generation model isn't a night and day experience. Yet if styling is important to you, and it is for most of us when it comes to our cars, this 2017 CX-5 is a big step forward.